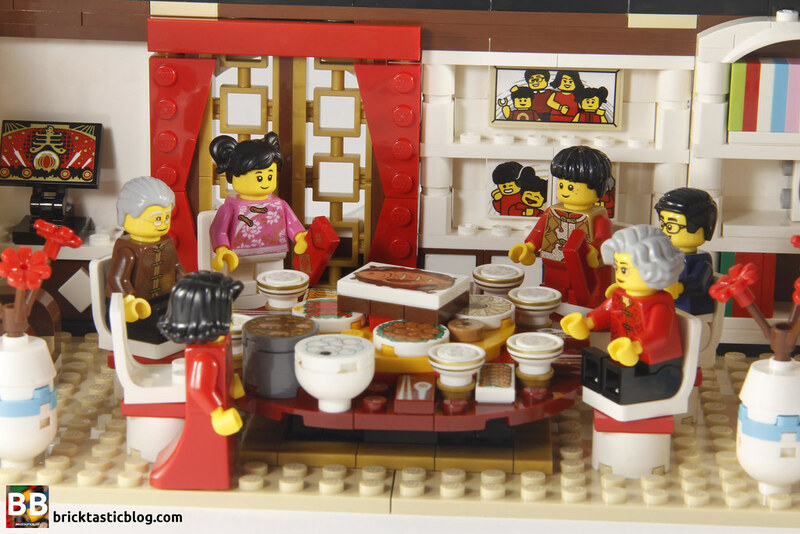 The LEGO Group are no strangers to Chinese New Year sets. They’ve been around for years, and take a little scouting around to get a copy of them. I’ve had the last few years, but 2019 – the Year of the Pig – brought in something extra special. 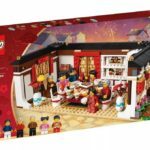 The Chinese market for LEGO is booming at the moment, so to celebrate that, TLG decided to release some absolutely stunning sets particularly for Chinese New Year. 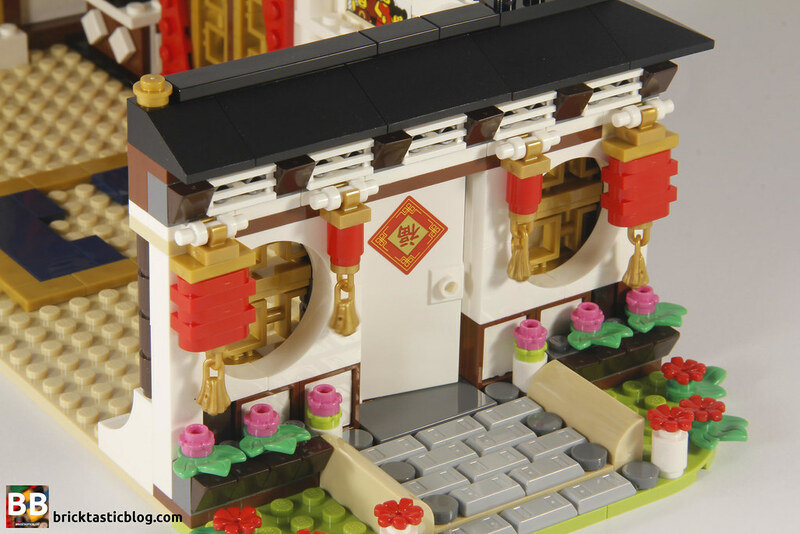 Normally the CNY sets are quite small, with just a brick build of the zodiac animal. 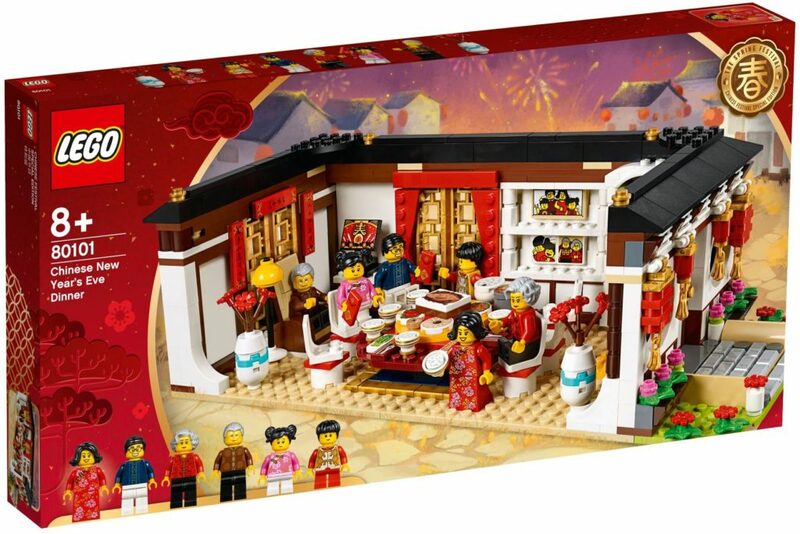 They’ve still done it this year, with 40186 Year of the Pig, but in addition, there’s more, with 80101 Chinese New Year’s Eve Dinner, and 80102 Dragon Dance. I’ll take a look at 80102 in the coming days, but as it’s Chinese New Year’s Eve today, let’s take a look at 80101. It was amazing to find out that Australians were able to get these sets as a part of the Asia Pacific region, but it definitely wasn’t amazing to go through the monumental effort (and for many, disappointment) of finding (or not finding) these sets. 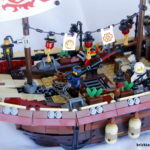 With the sets only being available from select independent toy stores, and not through LEGO’s own online store, it meant the sets were extremely hard to find. Most toy stores I contacted only had 3 copies of each in store. I was ecstatic when I found a couple of copies in a local toy store, but they were soon sold out. So, if you’re looking to get copies of these sets, you’ll need to pay an absolute fortune for them. I’ve seen prices over four times the original RRP, as soon as they hit the shelves. It’s a real shame that people are buying these to flip them for an exorbitant amount, as many of the intended market are missing out, but it was bound to happen. LEGO, if you do this again, as a bare minimum please make sure more sets are made! 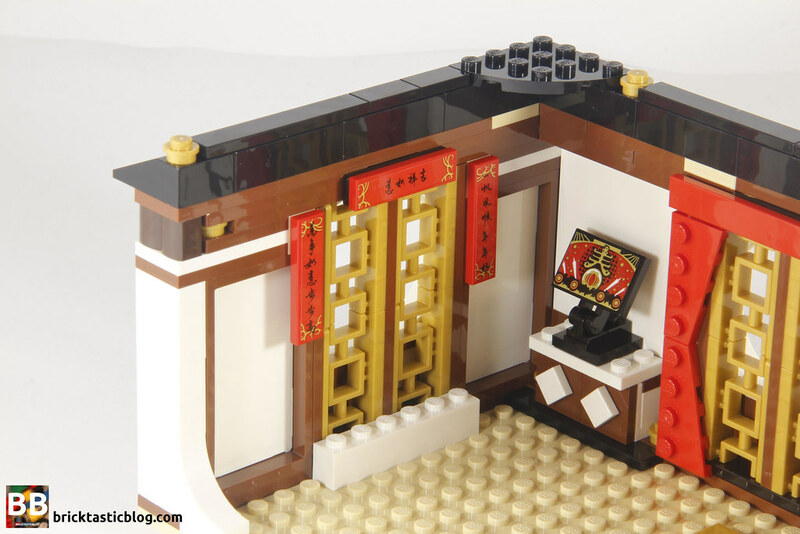 For a set like this one (and 80102), which is exquisite, more need to be made, as there’s a guaranteed massive amount of interest. Inside the beautiful box are five numbered bags, two tan 16×16 plates, an instruction manual, and a sticker sheet with nine stickers. 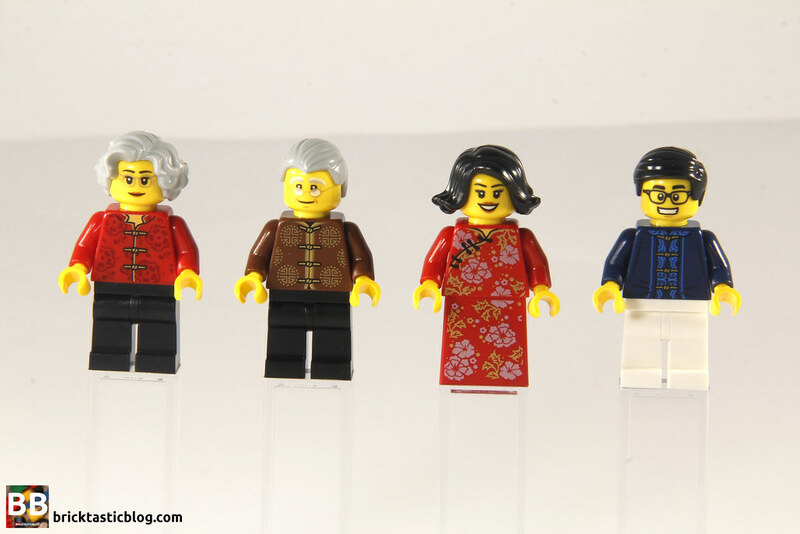 The minifigures in this set are one family – two grandparents, two parents, and two kids. 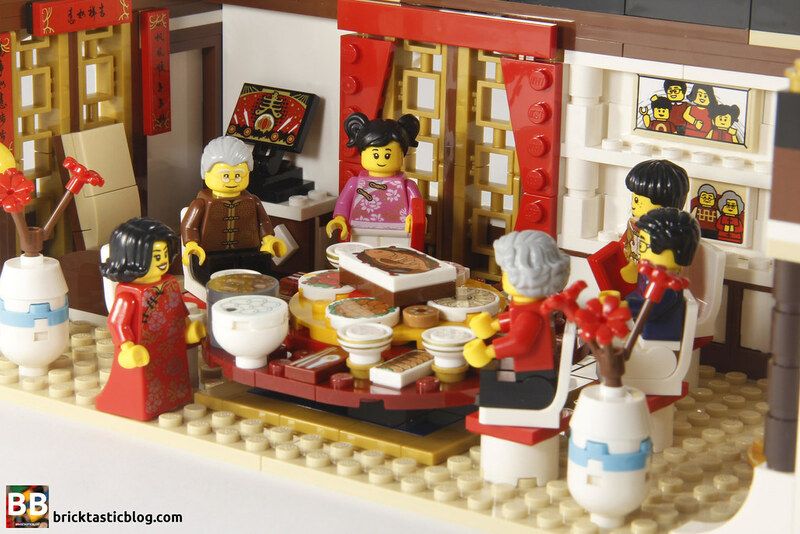 The practice of filial piety (at it’s base level – being good to one’s parents) is central in Chinese culture, so it’s great to see a full family here, and the printing on these minifigures is about as good as it can get. The designers have really honed in on the details! The grandparents both have grey hair and glasses, and some fairly simple items of clothing. The grandmother has a red top on, with a floral print and black plants, and the grandfather has a brown top with black pants. The grandmother also has a slightly different head print on the other side – smiling and smiling a little bit more! It’s subtle, but it’s different. 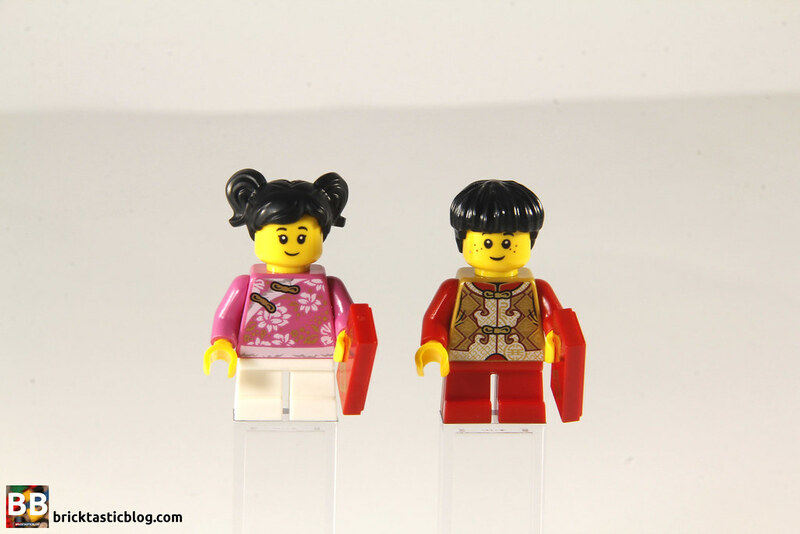 The next generation down are the parents, with one of the most beautiful minifigures I’ve seen in a long time. The mother has one of the new sweeping skirt elements, and it and the torso have a matching gold and white floral print. The father has an elaborate shirt on, with white pants. It’s much more simple compared to his wife, but it’s still excellent. The dad has a pair of glasses on with a big smile on one side, and a laughing face with no glasses on the other. It’s an excellent print. The final generation are the two kids – a boy and a girl. The girl has some new pigtails and a pink top, and the boy has a brilliantly detailed torso – it almost looks like armour! Both have alternate faces, with the little girl being very happy, and oddly, the boy is sad. I wonder why? Both kids also have the short legs, which makes it difficult for them to sit on the chairs in the set – they’ll have to stand up on them instead. The kids also both hold red packets, which are given to them by the married couples (their parents or grandparents). These are traditionally given to the unmarried members of the family and contain cash! No wonder the girl is happy! There is a plethora of brilliant element inclusions in this set, like the gold framework in the windows, the 2018 red flowers (red being the colour of prosperity), and all of those stunning printed food tiles. There’s also the bowls! 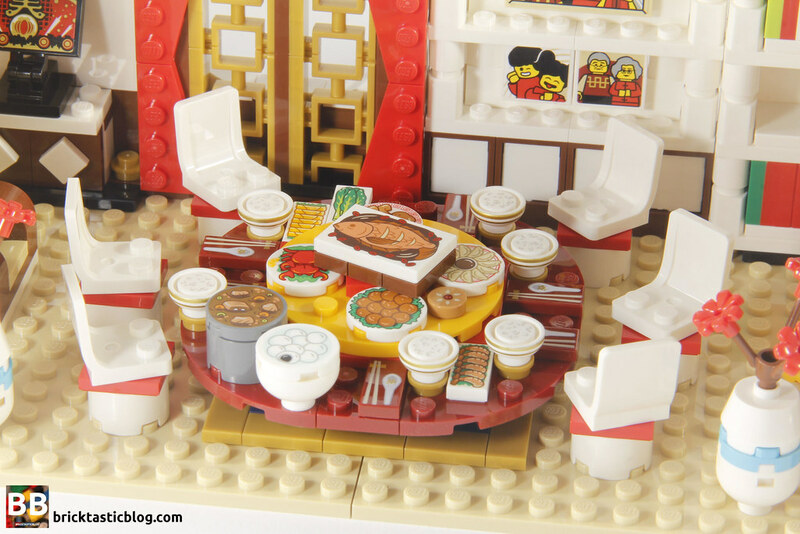 The food tiles are without a doubt the highlight of the set – there’s loads of different varieties, like rice, dumplings, cookies, fried chicken, crab, fried fish, spring rolls, bok choi, prawns, and chopsticks and a soup spoon. These tiles are brilliant, and is so crucial to a dinner based set. I’m looking forward to seeing where else these turn up. 80101 is a lot of fun to play with. 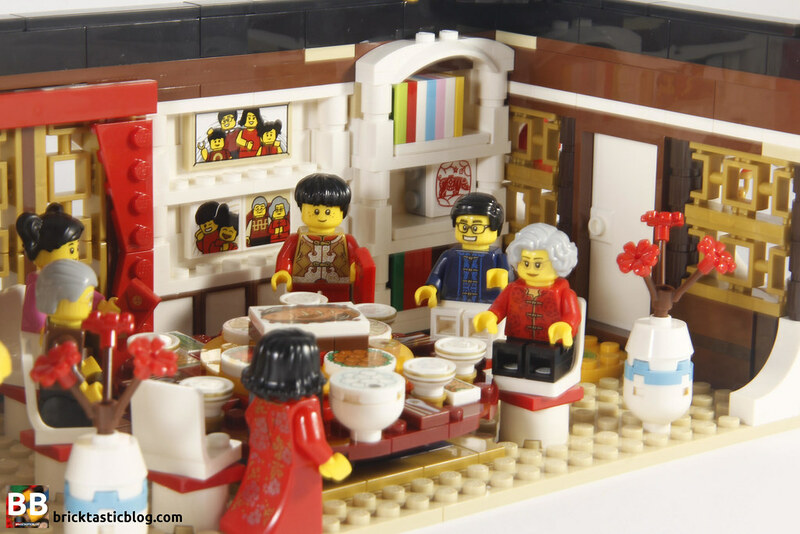 You might think it’s just a display set, and I’m sure for some it will be, but I think it’s going to be enjoyable for people to recreate their own CNY Eve dinners in LEGO. From the grandparents welcoming them in (assuming it’s their house! 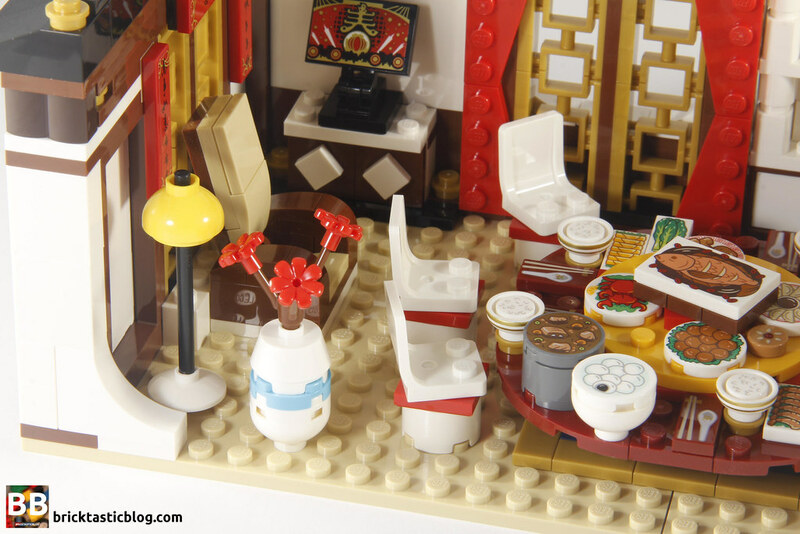 ), to exchanging the red packets, to sitting down for dinner, this could be a fun one. It’s deceptive, but engaging. The build begins with the garden on the outside. It’s easy, and before you know it you’re inside working on the walls and book case. The walls go up first, with a good portion of it made up of large panel pieces, hidden by book cases and shelves. The windows with the pearl gold panels are elegant, and built sideways to slide into the holes, before being capped off by plates. Once the exterior is done, the work on the centrepiece of the set begins – the table. It’s easy enough to do, but what’s surprising is that the table is so chock full of items for dinner, it doesn’t quite fit correctly, if you follow the instructions. There’s one bowl that’s knocked over a fraction, and a dish on the lazy susan that hits something else when it’s spun. Fixing the issue is very easy, by moving a couple of pieces here and there by a stud, but I’m amazed it got past the quality team. The final additions are the swivel chairs and the large plants and pots, adding the roof, and the set is complete. I think given the nature of the set, and the rarity, the build process is enhanced just that little bit more. To be honest, it’s nothing special, and uses techniques we’ve seen plenty of times before, but it’s still special in it’s own unique way. The design and appearance is where this set shines. It is nothing short of magnificent. The colours, the printed tiles, even the stickers, it all adds up to one of the most stunning sets to come out in the past year. I love the lanterns, cobblestone and round windows at the front of the house, and the little detail of the sticker showing the upside-down fu character. Fu means good fortune, and the words for upside-down and “to arrive” are pronounced the same, so linking these together implies that good fortune will arrive at the place. Adding it to the door translates to wishing good fortune would come to that house. It’s very clever, and something I didn’t know until now! It’s all of these little details that will make it extra special for those celebrating Chinese New Year. The table is beautifully presented, and the rest of the details look pretty spot on too. Even the outside of the building looks presentable. Similar builds would have the outside as a mix of colours and elements, but it’s well finished. If only I had the chance to pick up a second copy, it could have been made into a full house! The interior decorations around the wall are nearly flawless. There’s a book case with a bunch of items on the shelves, a section for some hung pictures, a big chair for grandpa, and another screen showing something, although I don’t know what it is! The curtains are simple, but perfect, and there’s some plaques with Mandarin on them as well, wishing blessings, prosperity and a good year ahead. For a set of this nature and rarity, I thought the price of $95 was quite reasonable. 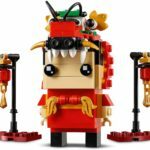 You get some of the year’s best minfigures, in a rare set that is nearly impossible to get your hands on, with some amazing printed elements to boot. I honestly think LEGO could have slapped another $50 on this price tag and they’d still sell like hotcakes, but what you get is definitely worth it. Just the knowledge that I had secured these two sets was worth it! This set is the definition of collectible. It’s mega rare, and looks gorgeous. Of course this is going to be collectible! Stay tuned – the next review is going to be 80102 Dragon Dance – another beauty!